I’m always so keen to try any new products from DHC and when I heard that Resveratrol was something found in the skin of red grapes my brain made an automatic link that said “woohoo – skincare and wine – it has to be good! Well, of course that wasn’t strictly true – what I was told was that Resveratrol is a powerful antioxidant found in the skin of red grapes which has been shown in lab studies to promote the Sirtuin “longevity” gene. So, first thoughts on this range was that the package and presentation was very retro, and really different to anything I’ve seen since – well the 70s at least! So what about the contents? 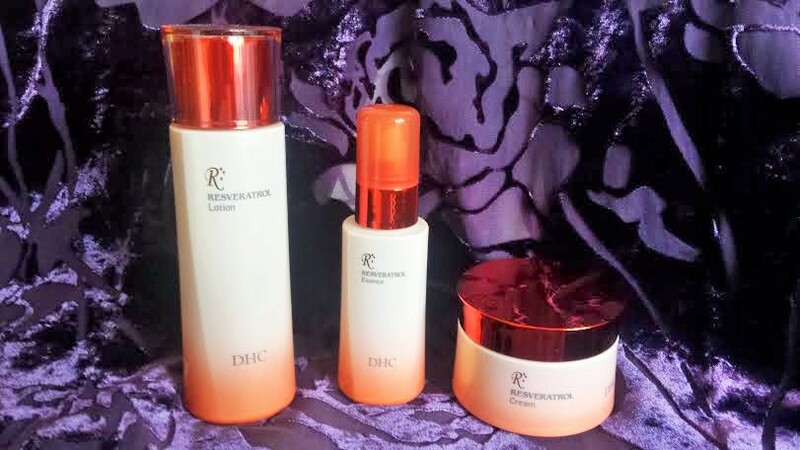 First up I tried the DHC Resveratrol Lotion. This is a toner, and in general I find that I don’t like toners, but I quite liked this one as it didn’t dry out my skin but seemed to kick off the moisturising process. It claims to fight the visible signs of ageing and promote smoother more resilient skin. It uses cereal extracts to hydrate the skin and help it to defend against environmental damage. The next layer of moisturising defence was the DHC Resveratrol Essence. I’m not totally sure that I’ve worked out the difference between an essence and a serum. I kind of think that it’s just the fashion to use the word essence instead of serum but whether that’s the case or not it’s the product that goes on first next to the skin before moisturiser. It has a luxurious feel and gives a big boost to moisture levels. The final product in the trio that got me the best compliment I’ve had in forever, (I was told I looked radiant after only a few days of use!) is the DHC Resveratrol Cream. The texture is quite unusual as it’s quite springy to the touch but it’s a richly moisturising cream that combined with the other two products stays on the skin, protecting it all day. Having applied it this morning around 8am my skin still feels amazing. Dare I say the best it’s felt in I can’t remember how long! Each of the products costs £43.00 but if you’re quick they’re available here with 20% off for a limited time. If you haven’t tried any products from DHC yet – I think it might be time to give them a try. These products were gifted to me for review but the opinions are my own and are not precribed. This post contains affiliate links. Next postSome you win, some you lose! I love DHC as a brand and am a big fan of essences, great for really deep hydration.